Claire Gregory, a former participant on one of our permaculture courses, had just achieved her ambition: she’d bought a field on the edge of Sheffield, where she lives, to establish a wonderful diverse community gardening project. The offer came from a well-respected local gardening activist. Not sure whether to accept, Claire emailed me for my opinion. Well I would say that, wouldn’t I? I’m a permaculturist and we’re well known for our no-dig/no-plough principle. But it’s not as black and white as people sometimes assume. On our permaculture courses we don’t teach people ‘Thou shalt not dig.’ Instead we have a session entitled ‘To Till or Not to Till?’ tilling being a general word for digging and ploughing. We look at the reasons both for and against tilling. It turns out that there are more good reasons for not doing it than for doing it. But it would be arrogant and foolish of us to ignore the reasons why it might sometimes be a good thing. After all, people have been doing it for thousands of years. 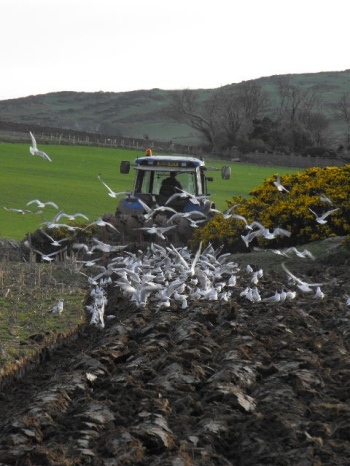 Seagulls feasting on earthworms – just one of the ways ploughing destroys soil fertility. There’s general consensus among people who know about soil that not tilling is best for soil fertility in the long run. Ploughing and digging are more often a matter of fulfilling some short-term need, like turning under a vigorous growth of annual weeds on an organic farm, where spraying them with herbicide is not an option, or mixing compost into a garden soil which has a drastically low humus content. But in Claire’s case, what short-term need could be met by ploughing? People sometimes mention relieving soil compaction. There was no evidence that the soil of Holly Hagg, Claire’s project, was compacted and if it was ploughing is not the best way of curing it. There’s a machine called a subsoiler which is specifically designed to do this. On a smaller scale a broadfork is the tool for decompacting soil. A well-established sward of grass gives ideal ground conditions for starting a new project like Holly Hagg. It’s a large site, with many different elements, including vegetable garden, forest garden, herb beds, pond etc, all being developed over a number of years. You can walk on grass, drive on it and store materials on it. The network of roots and stems helps keep the soil uncompacted and gives a surface that’s a pleasure to move around and work on. As each part of the site is developed the grass in that area can be mulched out or dug just before planting up with the intended crops. By contrast, a ploughed field would be a terrible surface to work and move on, muddy in winter and hard in summer. Soon it would be colonised by thistles, docks and so on, rather than the benign grass that was there before. The soil would be exposed to erosion and easily compacted by any activity. I can only assume that the person who so enthusiastically suggested ploughing was running on automatic. ‘What do you do with land? Simple, you plough it!’ It’s not the only time I’ve come across this attitude. My colleague Sarah Pugh asked me if I’d like to help her students with their permaculture design projects by being available to advise on any problems which cropped up. One of these projects was an orchard and it wasn’t long before the students rang me up and said that their client had just had the field ploughed prior to establishing the orchard. What could they do? Well it was too late by then to do anything about it. Everything I’ve just said about establishing Holly Hagg applies equally to an orchard. 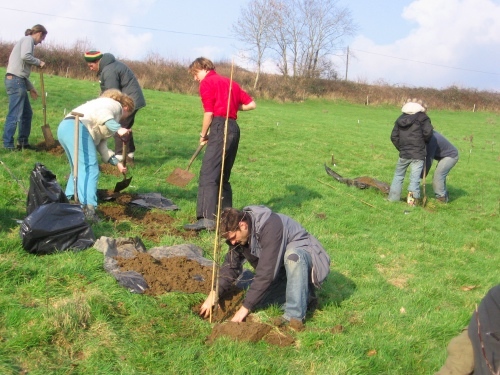 Imagine floundering around in winter planting trees on a ploughed field. It doesn’t bear thinking about. Planting an orchard. Imagine doing this in a ploughed field! Two important points about permaculture design emerge from these stories. The first is that you need to get your permaculture designer in right from the start. Permaculture is good at dealing with wholes. People sometimes think they will make the overall decisions themselves and get a permaculturist in to design a specific part of the site. This is almost always a bad idea because those overall decisions are the most important ones. The other one is the principle of ‘do nothing’. Often I find when giving permaculture advice to people that the most important things I can tell them are not so much what to do as what not to do. This ploughing business is a good example. Not only is it unnecessary work but in this case positively harmful. Other times it’s just a matter of saving people a lot of hard work. The look of relief on their faces when I tell them they don’t need to, for example, get rid of the gorse growing on a hillside before they plant trees there, can be one of the most satisfying moments for a permaculture designer.